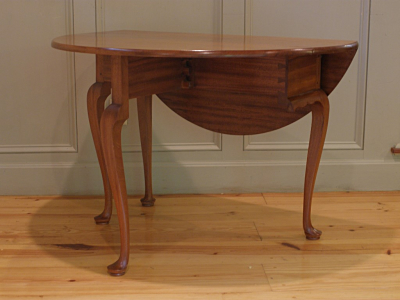 Furniture designs from the eighteenth century have endured because they are beutiful and functional. Here are a few examples of pieces that I have reproduced following original designs and details and using traditional construction methods from the period. 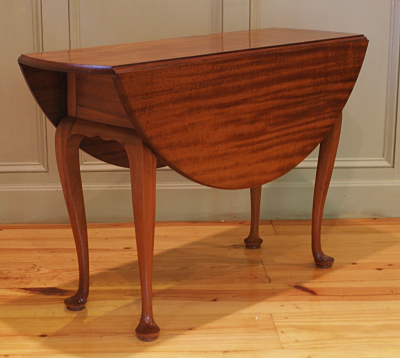 These designs can be made in a variety of woods, including Mahogany, as shown, Cherry, Walnut or Maple. The finish is polyurethane varnish, which is tough and waterproof. I apply three coats, polish to a high satin sheen, and that gives a beautiful, durrable finish. Dropleaf Table, open. Hand cut dovetail joints at the corners, Knuckle joint for the swing-out leg. 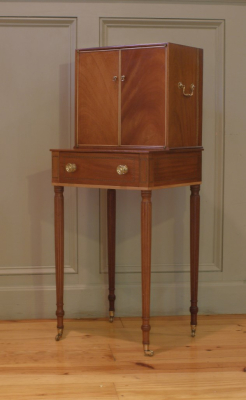 Queene Anne Highchest, c. 1720. Mahogany. Hand carved scroll pediment, shell motifs and finial. Hand cut dovetailed drawers. Period hardware. Empire Side Chair. c. 1800. Mahohany. Queene Anne Easy Chair, c. 1720. Mahogany, Upholstery. 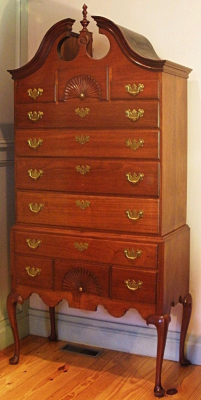 Small Sheraton secretary, c. 1790. Mahogany. Turned, carved legs. Period hardware. $1,200.00 One of a pair.